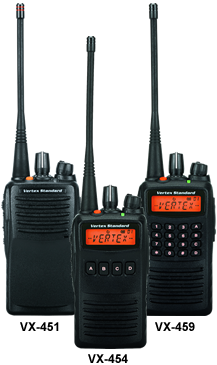 When constant contact is required at all times, Vertex Standard’s exclusive Auto-Range Transpond System (ARTS™) is included to inform the user that other ARTS™- equipped radios are within communication range.No two job sites are alike and the optional Man Down function (with DVS-9 unit) is programmable to monitor a variety of worker timed safety scenarios vertically and horizontally as well as worker degree of motion. Adjusting the settings of the 3-axis sensor adapts the radio to each distinct work environment to monitor movement. Includes Channel Announcement which loudly speaks the channel description to simplify changing channels when focused on other tasks simultaneously.Features voice activation (VOX) when used with MH-81A4B headset that enables users to transmit voice without pressing the Push To Talk button for hands-free operation.